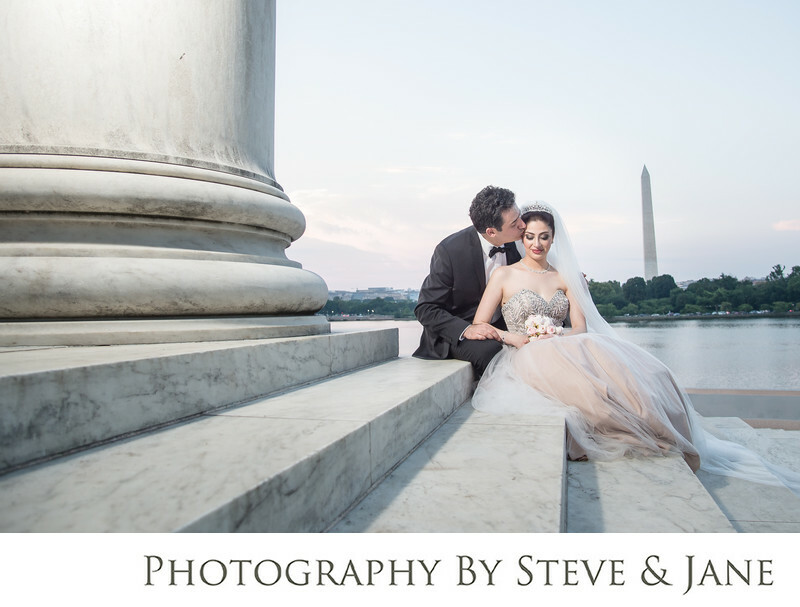 When you plan a wedding in DC, you want to include all those iconic DC monuments. While it's hard to get a photo AT the Washington Monument, the Jefferson Memorial incorporates that skyline that the district is known for along with it's own marbled pillars and stairs. If you are considering adding a stop or two so you can highlight our capital's beautiful monuments, there are a few things to consider. You need to obtain a permit to take portraits at any monument. Currently, this permit fee is $40 with a $90 location fee for up to 10 people. The location fee is higher for larger groups. Consider the time of year for your monument portraits. As our nation's capital, DC is a tourist destination. Even when you have a permit, you are not allowed to interfere with tourists. Cherry blossom season and the summer have larger crowds on the weekend. This can interfere with your portraits. Allow enough time to get to the monuments, walk to the location, and get back to your venue. Arrange for a vehicle to drop you off and pick you up so you don't have to worry about spending extra time looking for parking. We love DC and all it's gorgeous locations. We know how to help you navigate the permit process and plan your wedding day timeline so you can relax and enjoy!